I chose the verb to pray instead of the noun prayer because it is something we should be doing all the time. It is interesting to note that God did not make prayer a mitzvah (commandment or good deed). Yet we somehow know deep in our hearts that we always ought to be praying to God. Praying is a part of who we are as we are made in God’s image. He communicates to us and by extension, we should be praying to God. God is a god of communication, and since we are in His image, we, too, are creatures of communication. Although we see people praying at set times (like Daniel and David), yet God has not set a specific time or number of times during the day, to pray. Were a person to know the time when, if they pray, they will be answered, they would leave off other times and pray only then. Accordingly, the Holy One said: For this reason I do not let you know when you will be answered, so that you will be willing to pray at all times, as is said, ‘Put your trust in God at all times’ (Psalms 62:9)” (Aggadah Bereshit 77). Praying should be as automatic as breathing. It is a way of life, not mere moments in time. Pray without ceasing, says 1 Thessalonians 5:17. Why did the people of other nations come to the Hebrews for prayer? Because they knew that the God of the Hebrews heard His children when they prayed. Their own gods were incapable of hearing, but they knew that the Hebrew God not only heard prayer, He answered it as well. Making prayer as automatic as breathing requires devotion. It is an acknowledgment of the world as it truly is. It is a recognition that not are we small and limited in the universe, but that we also have the capacity for goodness and greatness. We seem insignificant but have the attention of Almighty God. We are not alone, nor are we helpless. God is just a breath away. In Hebrew, the word we translate love is a•ha•VAH (אהבה). Interestingly, it is both a verb and a noun. The root of the word is אהב, which means to give. In most of the English-speaking world, love is thought to be an intense longing for another person, a feeling that is crucial to our well-being. But that only begins to scratch the surface of what ahavah truly means. Jewish people in the past regarded love as something you did, not as a feeling. In the most sacred prayer, foundational to Judaism, we are commanded to love God. It reads (in English): “Hear, O Israel, the Lord thy God, the Lord is one.” It comes from Deuteronomy 6:4. To pronounce it in Hebrew, you would say: Shema Yisrael, Adonai eloheinu Adonai ehad. Now God is not so capricious as to command us to have a feeling. We really have not much control over our feelings, but we have nearly total control over our actions. That’s when ahavah ceases to be a noun and becomes a verb. A verb is an action word, something we do. So when we are commanded to love, we are not commanded to feel. That’s a different verb. The Jews see ahavah as a form of giving. We think that we give because we love. But in essence, it’s the opposite. We love because we give. We love our children because we give to them. We give them life, food, clothing, education, gifts, etc. We shower gifts on those we love, and we tend to think that we do it because we love them. The Jewish perspective is different. To foster love, according to the late Rabbi Eliyahu Dessler, we must be generous. If we extend what we have in our hands and our hearts, love will grow. He explains that giving to another human being is an extension of ourselves. Our soul (Hebrew NE•fish) becomes knit with one another. David and Jonathan loved each other, and their hearts were knit together. Giving ourselves to another creates a bond that in the spiritual is a real thing. The proof of that is the pain we feel when our soul is torn from another when relationships split up. We “become one flesh” when we marry. Divorce or the death of a spouse renders the soul in the most intense pain you can endure. To love, we must first be generous. To be truly generous, we need to give without self-interest. If we give expecting anything in return (including love), it is a transaction. Yet when we transcend the selfish self and share or give something that is dear to us without any thought of recompense, it triggers love. It doesn’t matter what we are giving—it is the selflessness in giving that elicits a love response. To give ahavah (which means give in its root form), we bridge the gap between souls and start the process of soul-merger. That is the very definition of ahavah. For premillennialists (those who believe that Jesus will have an earthly reign after the rapture of the church), it’s difficult to understand why there would be animal sacrifices during the millennial reign. After all, Hebrews 10 makes it very clear that God does not desire sacrifices and that Jesus’ death was the ultimate sacrifice once for all. Perhaps the best description of the Holy Temple of the Millennial Kingdom occurs beginning in Ezekiel 40. In Ezekiel 43:18-46:24, God gives explicit instructions concerning sacrifices and how they will be performed. So we know that there will be animal sacrifices then. In fact, without them, Daniel 9:27 would have to be completely misconstrued. So why would God set up animal sacrifices in the Millennial Kingdom? First, it is important to note that Jesus’ sacrifice offered the perfect atonement for all the sins of mankind from the beginning of time until the end of time. Do not think for one minute that sacrifices made in the Old Testament took away the sins of the Israelites. According to Scripture itself, that would be impossible. The reason most Christians don’t agree that there will be sacrifices once Jesus is reigning is because they don’t understand what sacrifices were supposed to do. Animal sacrifices were designed to make men face their sins and realize that they were in need of God. The sacrifices were meant to bring the Israelites to repentance. The Hebrews of early Judaism were not cold, unfeeling people. They actually loved their flocks, sometimes allowing kids and lambs inside their own houses, particularly before Passover. That Paschal lamb was taken into the house four days before it was to be slaughtered. These Jews, as I said, loved their flocks. (That’s precisely why Jesus used the analogy of taking care of sheep and calls us the sheep of His hand.) If you have a pet, you know how fond of them people can be. Now, don’t get me wrong; I’m NOT saying that the Jews looked at the Paschal lamb as a pet—far from it! But having an innocent, baby animal in your home for a protracted period of time brought them severely up against the seriousness of their sin. It would require an animal being slaughtered on their behalf, shedding its own blood when it had done nothing wrong. In fact, it was to be a perfect lamb. Sacrifices were never provided to win God’s favor. The Psalmist makes it abundantly clear that the sacrifices that God has regard for are a contrite heart and a humble spirit. Those, God will accept. God made the animals for His and mankind’s enjoyment. And the very first sin caused an animal to be sacrificed to cover man’s sin, not take it away! So what will the sacrifices do in the Millennial Kingdom? been for mankind’s benefit. To bring us up short and show how serious it is to violate God’s commands. Sin separates us from God. When the sacrifices on the altar in the New Kingdom take place, in those sacrifices there is a reminder of sins year by year. The saints who are ruling with Jesus in that time will not be offering sacrifices even as a reminder of past sins. Because when a person—whether Jew or Gentile—receives light and life through Jesus’ sacrifice, that person is made completely new. The sinner he was no longer even exists. He does not need a reminder of sin, because sin belonged to a different creature, and because he will joyously be serving God as a creation who no longer sins. A Paradox: Holiness among the common. Elul is the 12th month of the Jewish year, a period of paradox just before the new year and high holy days begin. 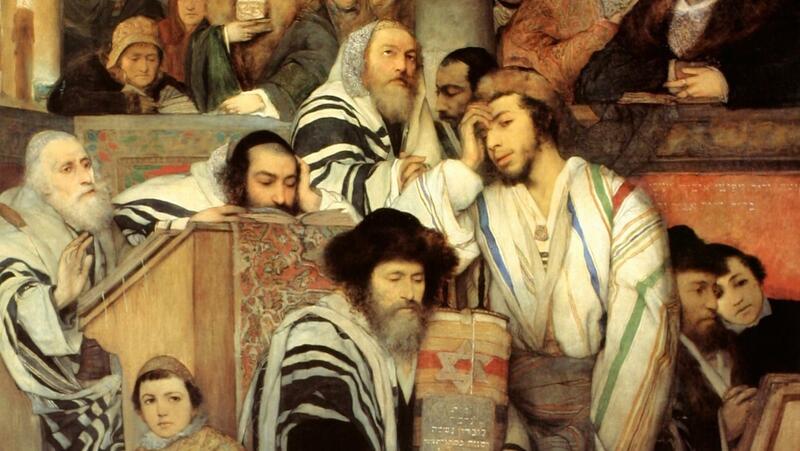 It is a time of introspection, when Jews examine their hearts and repent for their sins. At the same time, it is when God showers His mercy on them. In Judaism, there are holy times and there are “profane” (or common) times. The entire month of Elul is considered holy. I once heard it called “a haven in time, a city of refuge from the ravages of material life.” I love that analogy because it reminds me that in the end days, God will make a place of refuge for those who believe in Him. The name Elul is an acronym. “Eina L’yadi V’samti Lach” means that the Messiah will have express knowledge of the Torah, and so this is a time for studying Torah for Jews as well. As Christians and Messianic Jews, we know that Yeshua (Jesus) is the Word of God. He proclaimed that He came not to abolish the law (Torah) but to fulfill it. Interestingly, The Talmud says, “divrei torah koltin” (the study of Torah provides refuge). The next acronym is “Et L’vavcha V’et L’vav” meaning “teshuvah” or repentance. This refers in Elul to turning back to God, repenting of our sins and seeking God’s ways. Believers in Yeshua know that they are given everything necessary to live life in a godly manner according to 2 Peter 1:3, and that they are already forgiven for their sins both past and future. We know that it is God’s lovingkindness, His mercy, that brings us to repentance (Romans 2:4). Next comes the acronym “Ani L’dodi V’dodi Li.” This comes from the Song of Songs 6:3 and translates to “I’m my Beloved’s and my Beloved is mine.” It speaks of love and commands “avodah” (prayer) during this holy month as well. The fourth acronym is “Ish L’rei-eihu U’matonat L’ev-yonim,” which means gemillut/chassodim (charity/kindness). God’s people are focused on taking care of the poor and treating everyone with kindness. Finally, there is one more acronym which I find particularly interesting. First of all, you have to read it backwards to get the acronym right. “L’Hashem Va-yomru Leimor Ashirah” which comes from Exodus 15:1, singing to the Messiah. But what does all this have to do with the king being in the field? Rabbi Schneur Zalman of Liadi has a metaphor that helps explain the paradox of Elul being a holy month yet made of workdays (work is commonly forbidden during holy times such as the Sabbath and festivals of God). Imagine a king in Israel. If you, being a common person, wanted an audience with him, you’d have to travel to Jerusalem from wherever you are. You’d have to pass through all the gates and checkpoints, go through all the ministers and secretaries (all the bureaucracy) before you could be granted an audience. Then you would have to behave in a specific way, use specific language, and follow a specific dress code. That’s the way it is on common days. But in the month of Elul, the king leaves his palace and stands in the field with the common people. They can approach him freely, even in the midst of their work, and he will listen to them with a smiling face and open arms. Even the highest ranking person in his court does not have this kind of access to the king when he is in his palace. But for this one month, the king is in the field. As we celebrate this month of holiness in our common workaday world, remember that the reason this is a holy month is because God is with us (Immanuel)! Yes, the King in in the field! So what did Jesus mean when He told His disciples that they would have the power to bind and loose? For many in the church today and stemming back to 1960, it referred to power over spiritual activity here on earth and in heaven. Jesus did say that the demons were subject to His disciples in His name, as evidenced in this scripture. Notice two things about this scripture. First, it applied to seventy two disciples sent out, not just to the twelve in His inner circle. What He gave to them, He also has given to us. Second, the demons were subject in Jesus’ name, NOT in any power the disciples had. This is a privilege of true believers who carry the Spirit of God in their hearts. Remember what happened when an unbeliever tried to use Jesus’ name to cast out demons? Casting demons out of people is something that every believer should be able to do in Jesus’ name. It is only His name that the demons respect, not the words we speak from our own thoughts or even our hearts. Remember that even Michael the archangel did not accuse Satan directly. So is that what Jesus meant? Were we to bind and loose spirits on earth and in heaven? If you take a Scripture in context, you have to look at who’s speaking, who’s being spoken to, how they would have understood the words spoken, and in what setting all this speaking happened. Remembering that this was a Jewish Messiah speaking to Jewish disciples, it makes the most sense to look at it from a Jewish perspective, does it not? In the context of teaching His disciples, this scripture is not talking about authority to bind and loose evil spirits. Why on earth would they ever loose an evil spirit? Or for what reason would an angel be bound? Jesus was discussing the sin in the church right before this verse. passage below illustrates exactly what Jesus was describing. That was then. But Jesus uses the future tense when He says whatever they bind on earth will be bound on heaven, and whatever they loose on earth will be loosed in heaven. So what was He talking about, exactly? Jesus was referring to the era when He will reign on earth as Elohim, HaMelech (God the King) and He will at that time give the keys of the Kingdom to His twelve disciples along with the authority to bind and loose. In other words, they will rule with Him. But His words also had an immediate context as well, as did most of what Jesus taught. In the time of the Apostles, they had the authority to make decisions as judges concerning judicial matters of the newborn church. Following Jesus’ teaching, they used their authority whenever and wherever it was needed. The Apostles also exercised that authority when some Jews were telling the Gentiles that they had to follow the Mosaic Law and be circumcised. They “loosed” them from the yoke of the whole Torah even though it continued to apply to unsaved Jews. Nevertheless, they “bound” them in certain restrictions. So were they abolishing the law? Absolutely not. This binding and loosing did not extend to nullifying the commands God had spoken, nor did it authorize them to make new commandments. Jews were still bound to the laws as God had given them, until they became believers in Yeshua HaMashiach (Jesus the Messiah). Even after coming to faith, Jewish believers in Messiah continued following the Torah commandments. Do some Messianic Jews today observe the old law? Once again, you need a Jewish perspective on the law. The Torah was not given as a burden. It is a cherished gift from God that shows Jews how to live a life pleasing to God. Of course, the law also provides punishment for disobedience. So when a Jewish believer in Christ celebrates the Feasts or rests on the Sabbath, he does not think he is garnering favor with God. He knows he is already beloved of God. Instead, he is worshipping God with his entire life. Since Paul recognized that the law was good, we should understand that we are not bound by the law of the Torah so that it is a burden, but in thankfulness for the immense gift bestowed upon us by a gracious God, we are loosed to delight in the law and celebrate the Torah and God’s appointed times, whether you are Jew or Gentile!